Over the last few weeks the phony trial against Venezuelan Opposition Leader Leopoldo López has been taking place. A judged ordered that López be remanded to custody–in solitary confinement, and at a military prison even though he is a civilian–for the remainder of the trial against him on charges of inciting criminal activities and arson during the opposition protests of February twelve, two thousand and fourteen. The government’s case against López is based on “subliminal messages” that he imparted during his political speech the day of the protest, which is what ordered some presumed protesters to set fire to part of the building that houses the Attorney General’s office in Caracas. However, the use of state institutions to launch legally baseless attacks against López is neither new nor aimed just at his person. When Chávez was alive and governing the Caribbean nation he repeatedly accused López and acted against him. López was banned I two thousand eight from running for elected office due to corruption charges levied by the government during his time as mayor of Chacao district in Caracas (in two thousand eleven the Inter-American Court of Human rights ruled that the government’s move violated his political rights since his ban did not follow due process under the Venezuelan constitution). Also, this current year several arrest warrants have been issued against leaders of the relatively new opposition party Voluntad Popular, which was founded and headed by López himself. In order to explain the strong emotion of resentment from the Chavista government against López identifying the type of emotion is primordial. MIT political science professor Roger Petersen’s has researched the relationship between emotions and politics. He argues that both anger and hatred can cause resentment. However, anger is the result of actions committed by someone detrimental to somebody else’s interest. On the other hand, hatred is resentment not against actions but against what someone is and represents. Furthermore, although anger is a strong emotion it does fade away overtime, which allows for cooperation and even reconciliation between conflicting parties over the long-term. However, hatred does not follow the same pattern and stays relatively strong even as the years pass. This makes reconciliation, or even cooperation, virtually impossible even in the long-term. This emotion leads to the drive to make the hated individual or group disappear. The reasons that explain the Chavista Regime’s repeated attempts to neutralize Leopoldo López is that he is the political antonym of the late Hugo Chávez in both personal and political terms. Therefore, Chavismo hates what López is and represents. In personal terms Leopoldo López does not differ completely from Hugo Chávez as far as who they are. For instance, both of them are of mixed racial heritage like about seventy five percent of Venezuelans, they do not have recent immigrant heritages, and both are very charismatic public speakers. However, what López is, is the exact opposite of the Chávez was. For starters López is a US-trained economist with a Master degree from Harvard University. In this previous sentence there are three properties antithetical to Chavista imaginary because: A) he is an economist (none of Chávez’ or Maduros’ ministers composing the economic cabinet has been an economist, which is reflected in the poor management of the economy), B) U.S. educated, and C) a Harvard degree is an ultra-bourgeois credential. Moreover, López, unlike Chávez, comes from an upper-class household. López’ mother’s side, the Mendoza family, is related to Lorenzo Mendoza who is the owner of Venezuela’s largest private enterprise–the Polar Food and Beer company. López’ bourgeois background is definitely at odds with Chávez’ humble one. However, the personal detail from López that is probably most difficult for Chavistas to assimilate is that he is a descendent from Simon Bolivar, Venezuela’s independence hero and the central image around Chavista nationalism. 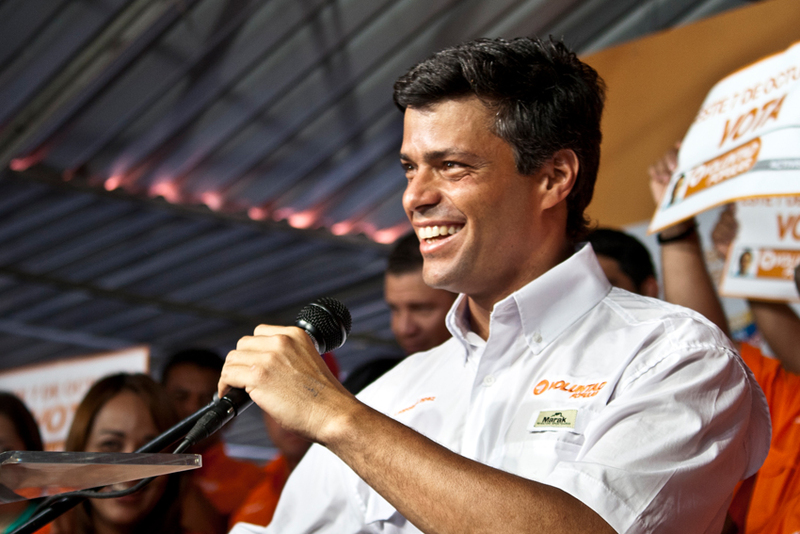 In political terms Leopoldo López’ party, Voluntad Popular, poses a challenge to chavismo like no other opposition party. Every Venezuelan political has been structured in a Leninist format, which means a personalistic and top to bottom organizational approach. A former communist, Romulo Betancourt, founded the first democratic Venezuelan party, the social democratic Acción Democratica. He developed the party structure based on a Leninist scheme and every Venezuelan party since has followed it–including Chávez’ own party (the United Venezuelan Socialist Party) and the current opposition parties. The only exception, however, has been the relatively small but growing Voluntad Popular party. López attempted political innovation by organizing the party through a bottom-up approach that was a detached from his personality as much as it was possible in Venezuelan politics. Voluntad Popular has been the only opposition party to hold primaries to elect its local and national leadership. The party’s bottom-up structure allowed it to integrate young people into its organizational structure and constituency (it is noteworthy that the mayority of the Venezuelan population is under thirty) and to penetrate slums much more effectively than traditional opposition. This approach showed great promise in the last municipal election. Voluntad Popular won almost all of the fifteen counties where the opposition won for the first time in the last fifteen years–all of them located in impoverished communities, which is the base of Chavismo. The innovative strategy of López’ party certainly intimidated the Chavista regime, which explains why it has issues arrest warrants or imprisoned key figures of its leadership. The fact that the up and coming Venezuelan opposition party, Voluntad Popular, was headed by Chávez’ antonym, Leopoldo López, was a major motivation to use state resources against it and neutralize it. Cooperation between the Chavista government and the opposition is very difficult, if not impossible. However, the presence of an antithetical figure such as López in the opposition, whose political strategy has been making gains within the base of Chavismo, the poor, adds to the government’s desire of eradicating him and his project from the Venezuelan political scene. Hate is a powerful emotion that causes strong resentment, and it hardly goes away. Daniel S. Leon is a Ph.D. candidate at the University of Leipzig, Germany. His doctoral thesis deals with the political economy of violence in Venezuela. He holds a M.A. in Political Science from the American University in Cairo, and a B.A. in International Relations from Florida International University. Leon has also worked as a visiting lecturer of international relations at the University of Los Andes in Merida, Venezuela.